Among the actresses whom Lee Seung Gi has cooperated with, Lee Seung Gi chose Ha Ji Won as her ideal lover. 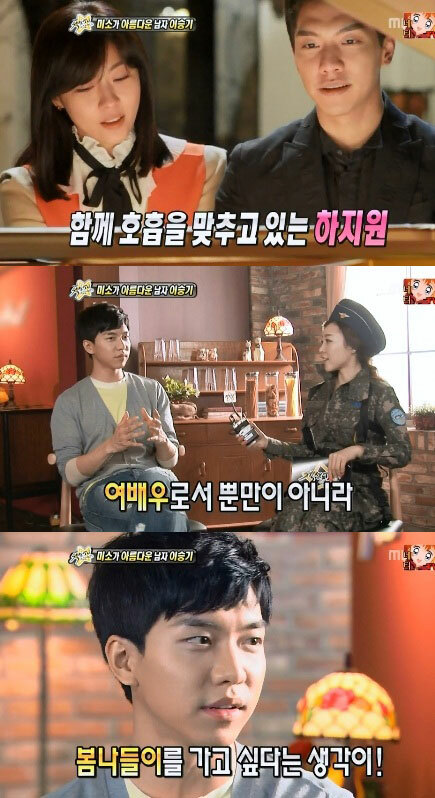 The MBC TV entertainment program “Section TV” broadcast on April 15th, 2012, Lee Seung Gi was troubled when facing with the question of “Among Han Hyo Joo, Shin Min Ah and Ha Ji Won, who is most closet to ideal type?” He chose Ha Ji Won, attracting attention. When asked if he plans to go for outing due to fine weather, he said, “I really like the sunlight, have the idea of going for picnic during rest time.” When asked if he would like to watch cheery blossom with girlfriend, he said, “I thought of it for a long time. But perhaps during the thinking period, the cherry blossom has bloomed 4~5 times,” provoking laughter.